DFA Product Simplification software utilizes an intuitive question-and-answer interface that identifies opportunities for substantial cost reduction in a product. By applying industry-tested minimum part count criteria, the software finds parts that can be consolidated/eliminated while maintaining 100% functionality. The outcome of a DFA-based design is a more elegant product that is both functionally efficient and easy to assemble. DFA re-designs also have the added impact of increased quality and reliability, faster development time, and require fewer suppliers. DFA establishes a rating for your product design in terms of its difficulty of assembly. The software rates each part according to how it is grasped, oriented and moved for insertion and to how it is inserted and/or fastened onto the product. By rule, products that are easy to assembly tend to cost less than assemblies that are difficult. DFA software provides you with objective, consensus-building information so your team can examine all the potential design solutions and select the most effective approach. You can easily incorporate product input from other groups, such as field service and marketing. The DFA index, a measure of assembly efficiency, serves as a basis for quantitatively comparing design alternatives internally or against competing products. The software yields an objective measure that is independent of product size or complexity. Add focus to design reviews. DFA analysis can guide the progress of a design, verifying improvement as it evolves. As you eliminate redundant parts or operations and remove assembly difficulties, assembly efficiency scores noticeably improve. The software helps designers establish the theoretical minimum number of parts for a product. In the process, engineers identify design concepts that reduce unnecessary complexity and cost. The DFA approach gives you an overall structure for making design changes in light of related material and manufacturing costs. Used together, DFA and DFM enable engineers to select appropriate and cost-effective shape-forming processes for components. DFA complements Design for Manufacture (DFM). Engineers use DFA software to reduce the assembly cost of a product by consolidating parts into elegant and multifunctional designs. DFM software then allows the design engineer quickly to judge the cost of producing the new design and to compare it with the cost of producing the original assembly. Used together, DFM and DFA software gives engineers an early cost profile of product designs, providing a basis for planning and decision making. Such analyses, when performed at the earliest stages of concept design, have the potential to greatly influence manufacturing and other life-cycle costs before the costs are locked in. 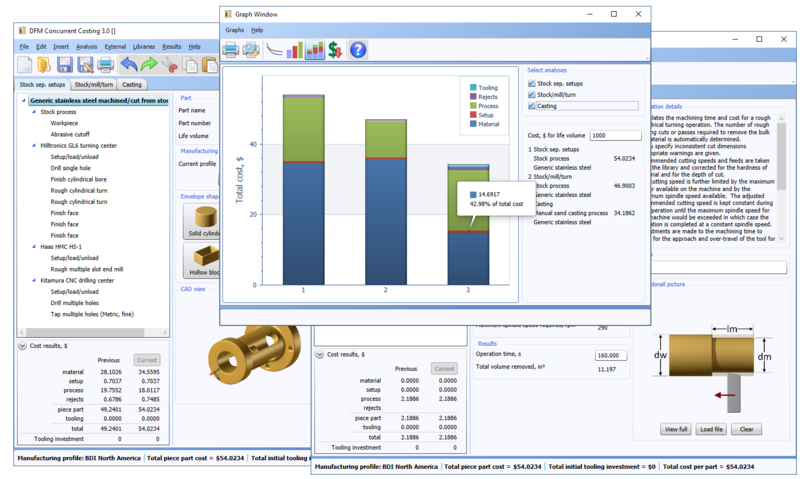 DFM Concurrent Costing software provides an immediate, thorough understanding of the primary cost drivers associated with manufacturing your product – and establishes a benchmark for what your product "should cost." Additionally, DFM guides you through an assessment of alternative processes and materials to help you generate various design proposals. 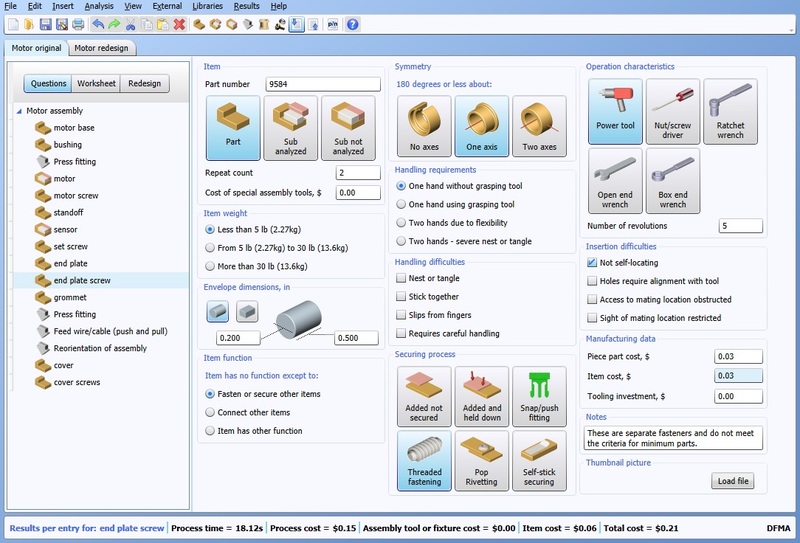 Cost results update automatically as you specify tolerances, surface finishes, and other part details. Gradually, as you choose effective shape-forming processes and consider how to modify part features to lower cost, your product becomes cost optimized. Thanks to over 40 years of industry experience, DFM consistently provides accurate feedback on the change in cost associated with changes in parts or their design. Parts that are more expensive to produce than others will always yield higher cost estimates, and the amount of added expense is always correctly portrayed in the DFM results, something that historical pricing and automated CAD analysis cannot do. Our approach to cost analysis provides superior accuracy because it correctly identifies each step required to manufacture the part and then quantifies each associated cost. DFM software delivers complete and accurate should-costing capability right out of the box. After installing, you gain immediate access to thousands of potential process, material, and machine combinations. Should you wish to add additional capabilities, you can easily create new operations and open and edit all of the existing libraries. Software training only takes a few days and generally results in users being completely self-sufficient in their usage. With DFM, there is no lengthy implementation or expensive customization necessary to begin enhancing your product development process. DFM shortens the product development cycle by providing early-stage cost transparency between design, manufacturing, marketing, finance and purchasing personnel. The ability to share cost information during early stages prevents many of the hurdles that the typical product development team encounters when trying to get a product to the market. Rather than simply providing cycle time and cost estimates, a DFM analysis educates the designer on the most important cost drivers of the proposed design. The availability of this information is invaluable when deciding how the design should be changed to reduce cost. As soon as improvements are identified, new DFM estimates can instantly be generated to get accurate results for alternative proposals. Thanks to reliable accuracy and transparency, DFM serves as a highly effective procurement tool. The software reports all of the values and assumptions that are used to generate a cost estimate. This offers a purchasing department far more negotiating leverage than a basic quote could ever provide. With DFM, supplier negotiation is about sharing relevant data instead of using pressure tactics to lower price. DFM allows you to benchmark a competitor’s product even when CAD models or supplier information isn’t available. An understanding of what the competing product “should cost” is gained and can be compared with the cost results for your own design. With DFM, a strategic advantage is achieved because the market feasibility for your products can be evaluated while considering the cost of your competitor’s products. DFM complements Design for Assembly (DFA). Engineers use DFA to reduce the assembly labor within a product through the consolidation of single function parts into more elegant, multifunctional designs. The DFM software is then used to help the design engineer quickly compare the costs to produce each alternative design. Used together, the DFM and DFA software give engineers an early cost profile for each product design and provide a basis for planning and decision making. Such analyses, when performed at the earliest stages of concept design, have the potential to greatly influence manufacturing and other life cycle costs before they are solidified and become locked in place. Assembly Fabrication, Automatic Assembly, Blow Molding, Die Casting, Plastic Extrusion, Hot Forging, Injection Molding, Investment Casting, Machining, PCBA, Sand Casting, Sheet Metal, Foam Molding, Thermoforming, Custom User Processes, and many others fully included. Fully Populated Operations, Machine, and Material Libraries. Cost Breakdown, Cost vs. Life Volume Graphs. Get an accurate result in minutes. Compare costs across different regions or suppliers. Select features directly from the model.